Residents of Palm Coast’s B-Section awoke Sunday to a morning soggy with the wreckage of Saturday night’s tornado. 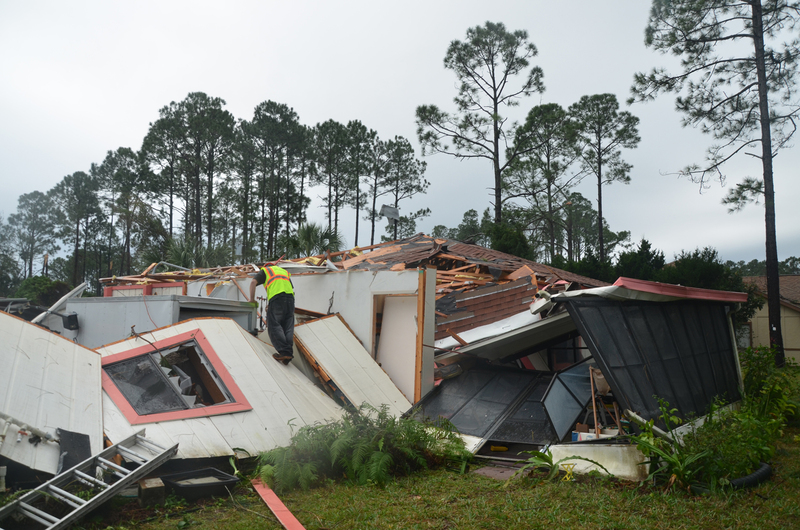 Some residents spent the night at neighbors after being forced out of their damaged, and in at least one case demolished, homes. 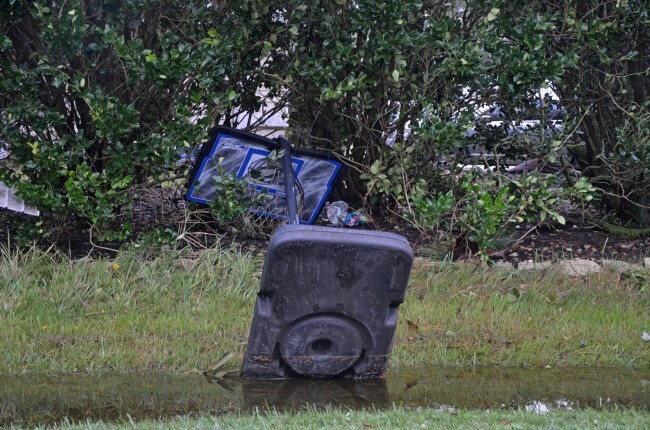 But authorities were reporting no injuries, and the most severe damage was limited to a dozen streets and a few homes, particularly along Bayside Drive and the streets that link to it–Bannbury and Bannerwood Lane. 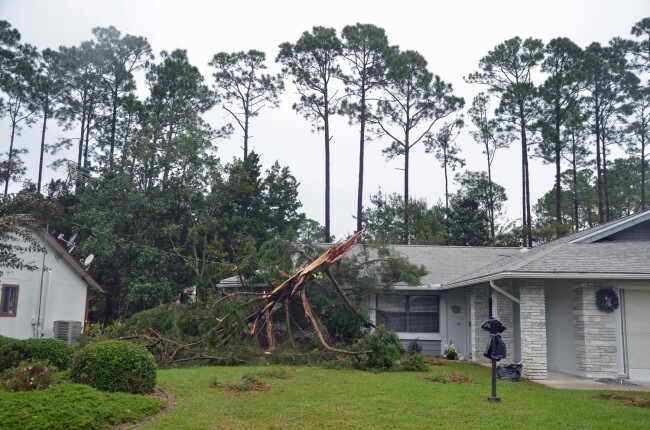 The National Weather Service confirmed that Palm Coast was struck by an EF1 tornado, which places the velocity of the tornado at between 73 and 112 miles per hour. (See an explanation of F-scale tornadoes here.) 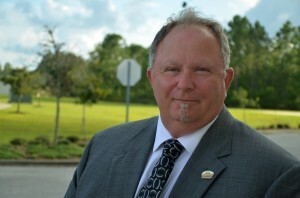 As such, it is the first one in the history of Palm Coast, at least since incorporation in 1999. 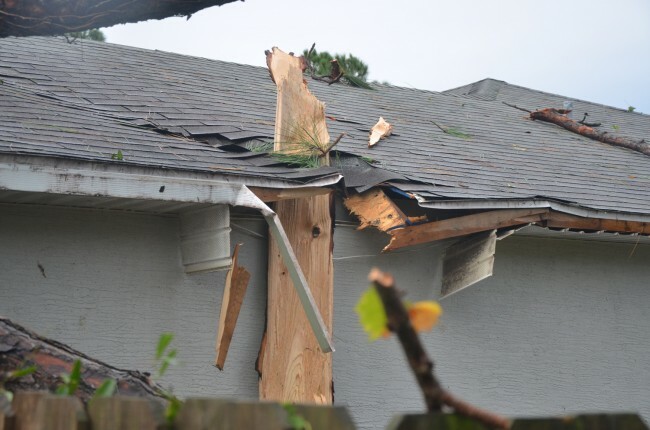 NWS later specified that the tornado was 25 to 75 yards wide. The city is estimating the value of the property damage at $5.4 million. In all, according to a tally provided by Palm Coast Fire Chief Mike Beadle, three to five homes were severely damaged, 15 had moderate damage, and 40 to 50 had minor damage. A later tally in mid-afternoon revised the figures significantly upward, to seven houses demolished, 22 with moderate damage, and 140 with minor damage. Daylight has a lot to do with it: the first tally was prepared at night, when firefighters could not clearly survey damage. The second tally reflects today’s house-to-house survey. The track appears to be from west Indian Trails’s B Section through parts of Palm Harbor’s F and C sections and small parts of the Hammock. 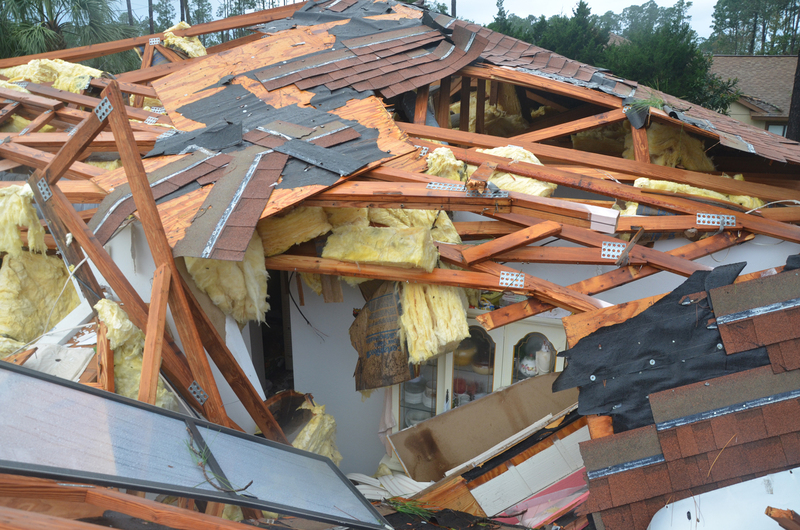 As tornadoes go, this one appears to have been more disorganized and temperamental than emphatically formed, as its path indicates several points of touchdown but no continuous or broad path: even the houses affected displayed roof damage to one section of the structure rather than to the whole structure. 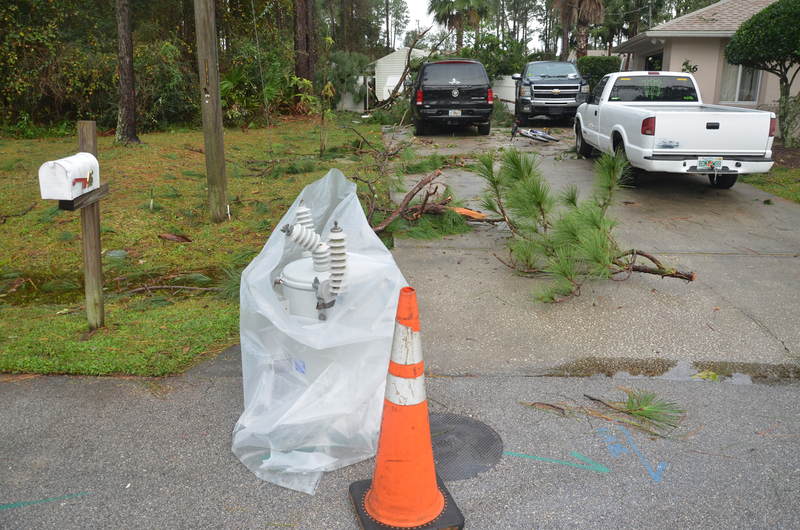 There were also reports that the severest storm started in the Espanola part of the county, west of Palm Coast. Crews have been investigating that area. The Deland and Deltona areas may also have been struck, but that’s not confirmed. “We have crews on the road as we speak, they hit the road 6:30, 7 o’clock this morning, to do a complete assessment of the damage. Those numbers will be given out later on,” Beadle said. Later in the morning 911 dispatchers began receiving calls from residents offering their volunteering services in affected neighborhoods. Beadle relayed to dispatchers that for now, residents are asked only to help their immediate neighbors—as many have been doing since last night—but that others are asked not to go into the affected areas to offer help, as that may hamper more than alleviate the responders’ operations. On the other hand, the Red Cross will be set up at Palm Coast’s City Offices at 160 Cypress Point Parkway for any residents in need of extra assistance. The Disabled American veterans are also offering assistance–clothing, food, and possibly some cash–if veterans affected call 386/439-2122. In a news release issued in mid-afternoon, the city provided additional numbers: To report other storm-related issues, the public should call the Sheriff’s Office non-emergency dispatch number at 386-313-4911. For a building- or code-related issue, call 386-986-3780 during regular city operating hours. For other issues, call Customer Service at 386-986-2360 during regular business hours. After hours, call 888-635-9806. City officials are cautioning residents about contractors, who began swarming on the affected areas this morning: residents must ensure that contractors are licensed and insured before they’re allowed to proceed to do any work. 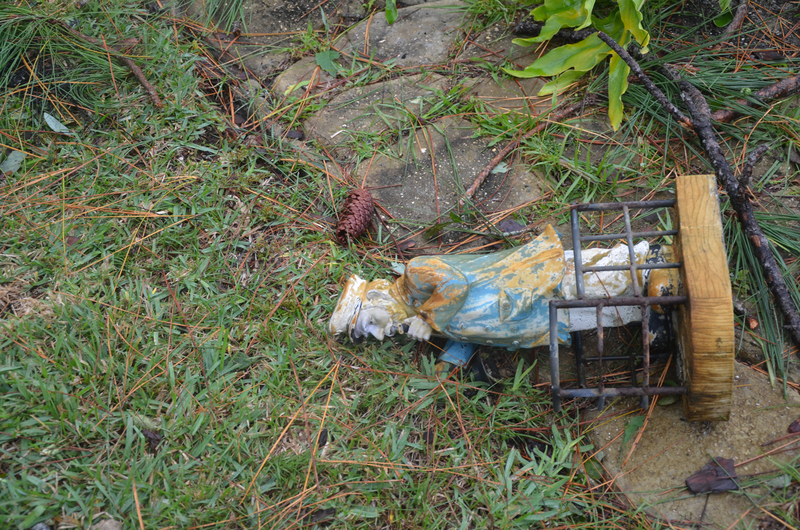 Residents themselves are cautioned against taking unnecessary risks as they clean up their property. There were only 51 houses without power as of 9 a.m. Sunday, down from close to 2,500 customers without power last night. The National Weather Service Sunday morning confirmed that it was an EF1 Tornado that struck Palm Coast. 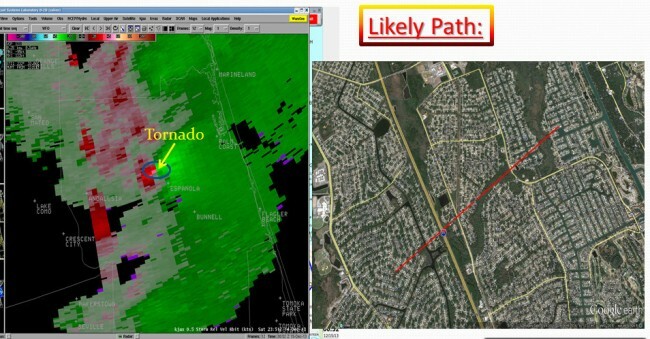 The NWS released the satellite image above, and the likely path of the tornado. Click on the image for larger view. 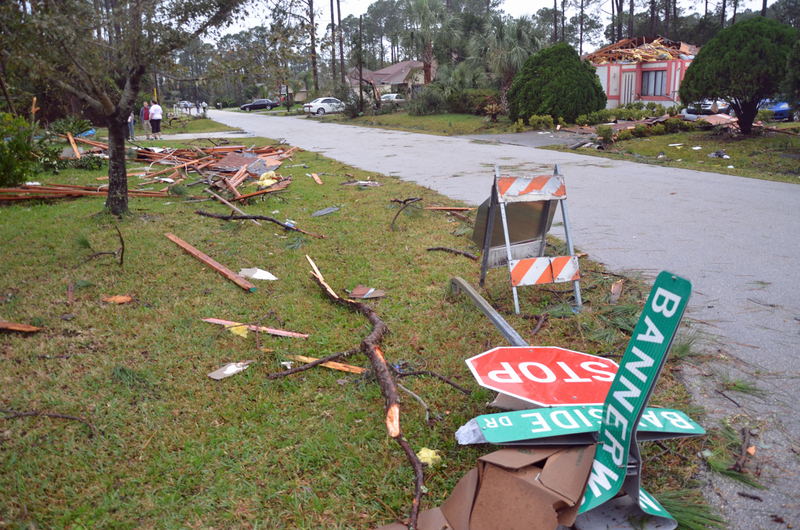 The B-section neighborhood affected Sunday morning was busy with the foot traffic of sightseers and residents surveying various streets as utility trucks, tree-removal workers and Flagler County Sheriff’s deputy patrols navigated between them. 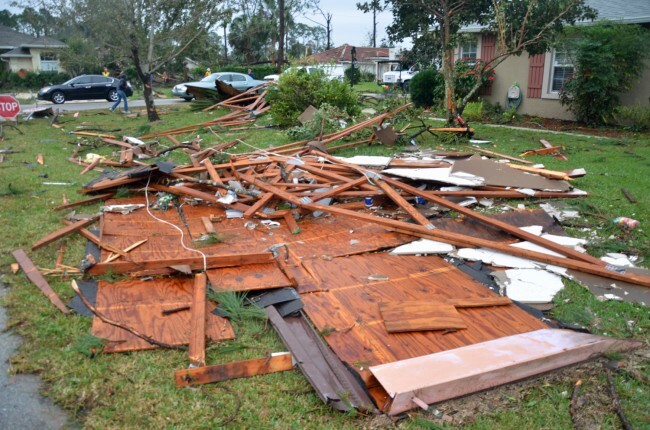 Several residents of damaged homes were in their front yards, either working to remove limbs and debris or trying to reach their insurance agent. 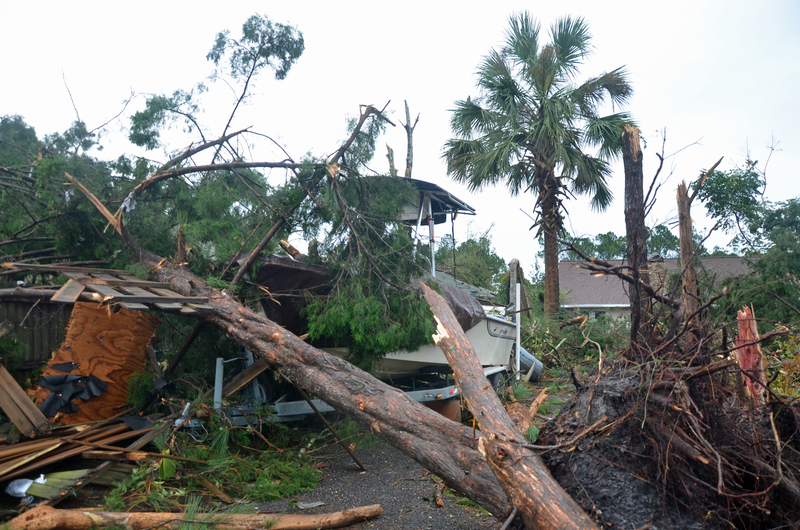 City officials recommend that residents document the damage to their home, even with smart phone pictures, before removing debris. One resident, who was hosting a birthday party for her 12-year-old son, compared the tornado to “a front on steroids,” another compared it to the sound of a freight train, and another to a sudden rush and house-rattle. All said the event came and went in a matter of seconds, perhaps 20 to 30 seconds. “My house exploded. It absolutely exploded,” John Coberly, 77, said. He lives–lived–at 57 Bannerwood Lane, off of Bayside. 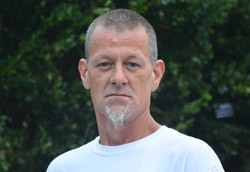 He was in the house that sustained the most damage in town: the house is virtually demolished, its roof as if blown off and strewn in Coberly’s and neighbors’ yards, and his two vehicles covered in debris. One of the vehicle’s front windshield was punctured. Kathy and James Cowdrey had been hosting a birthday party for their son Michael, who will turn 11 on Tuesday. James was in the backyard, grilling. 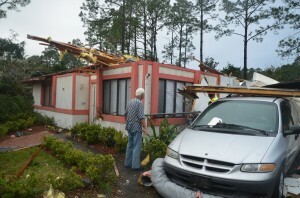 The couple had almost gone through a tornado before, in Orlando. It skipped over them. This one had a different character. “This was just a lot of lightning, and the wind,” Kathy said. “And you know what, it flipped over the barbecue and two of the smokers, and the meat was still good, and we had pork last night,” James said. The family’s 8-year-old daughter Lauren, who had been shaken by the event the previous evening, was recovering, asleep, in the house. Jake Kasica, 11, one of Michael’s friends, was over for the birthday party, and described the experience in one word: “Scariness.” He said he was also scared for his grandfather and grandmother, who live nearby. The additional 2:30 a.m. tornado warning Sunday temporarily got crews off the streets. They returned at daybreak. Staly spoke alongside Beadle and Netts at a 9 a.m. news conference at the city’s offices. Please help preserve and support dedicated coverage of our communities by contributing to FlaglerLive. FPL worked swiftly to replace blown transfomers. Thank you Pierre, for the swift and accurate coverage through the night and into today. You are a true asset to our community. 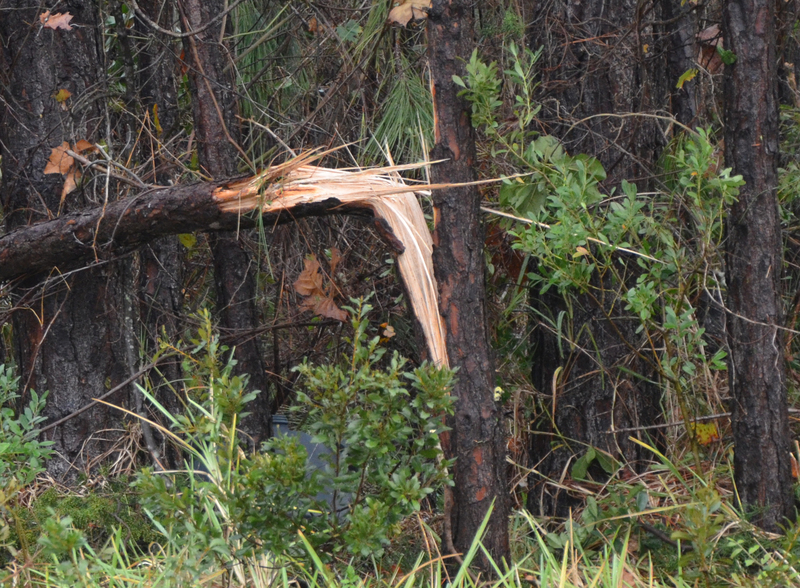 My heart goes out to all of those who had damage from last night’s storms. Just glad there were no major injuries. I believe an EF-1 tornado would be 86-110 MPH. Thank you for all that you’ve done in coverage of this event. Your attention is vital to our community and is greatly appreciated. Scary, thank God there were no major injuries, even with all the modern technology there was still no warning. Palm Coast is fortunate to have top of the line first responders, thank you to all of them. A microburst carries wind strengths similar to the strength of that of a tornado. How is this confirmed to be a tornado? No tornado damage televised has had the same similar characteristics—-tornado or micro burst…will we ever know for sure? The National Weather Service has experts that are trained to determine from the damage pattern that it is or isn’t a tornado and they examined the damage and weather data (like the characteristic radar signature of a tornado, which was present) and declared that it was in fact an EF-1 tornado. 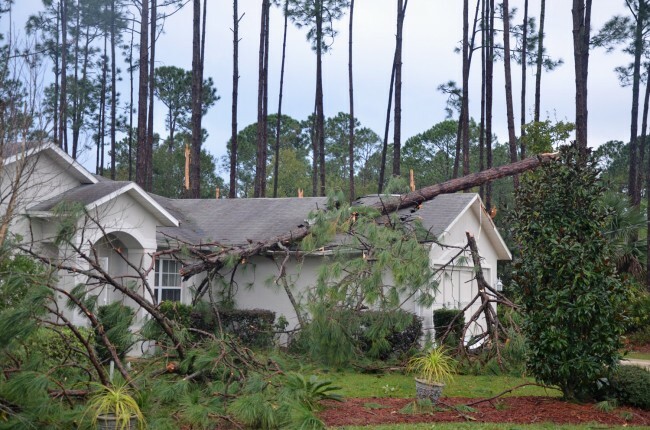 Damage from microbursts and tornadoes looks different – the wind speeds can be equal but the wind directions are distinctly different. Looking at the direction that debris was thrown is a big indicator. 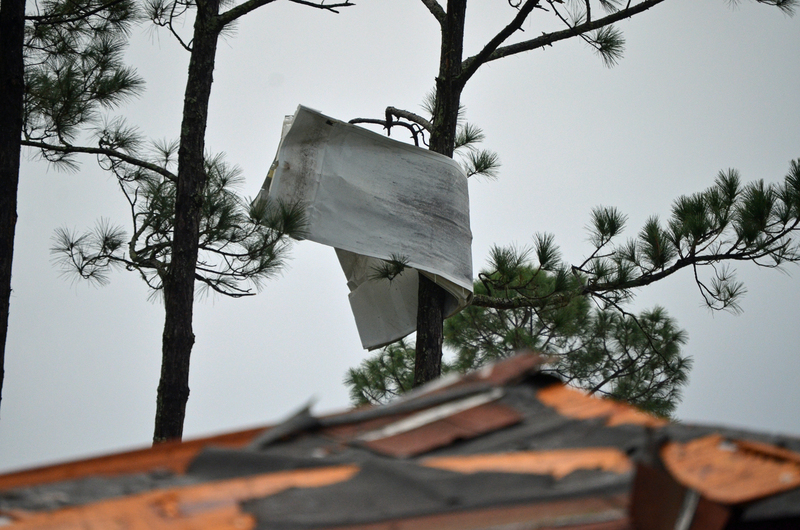 In a microburst, all debris is thrown outward from a center point, whereas in a tornado the winds are rotating and so on one side of the funnel debris moves one direction and on the other side it moves the opposite direction. Micro bursts don’t tear a straight line path for miles like this storm did – they are very localized, whereas tornadoes travel. Also, people who were hit by the storm (including my mom) heard the characteristic “train” roar of a tornado. 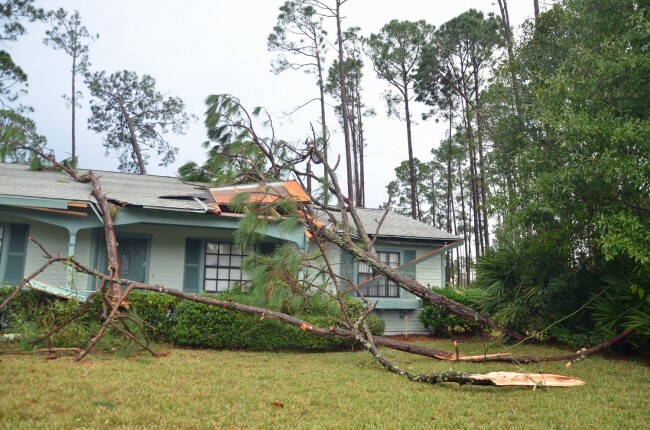 Typically a microburst will offer straightlined windshear, not the updrafts as evidenced by the roof that was lifted off of the home in the one photo. I’m writing from my home in Colorado, and I’m the owner of a home on Ballenger Lane there in Palm Coast. I heard about the totnado on the radio here on Sunday morning, and that it had struck the B section, so I realized my house may have been in the path. I’ve been following the internet coverage intently and it certainly appears to be tornadic damage, not windshear, and the Megacyclone Doppler images showed the typical hook echo area that is always seen in a tornadic event. I’d bet the farm that it was no doubt a tornado. remember manfre’s not asking you to stay out of those areas, he’s telling you! somebody should have told him that he cannot take our patrol car we pay for to virginia to visiy family. and we wonder where the gas is going we pay for? the vehicle doesn’t belong to him, it belongs to the people. the gas in it, the tires, oil, and mileage all belong to the people. by the way, if our patrol car wasn’t in virginia then it would not have gotten hit by u-haul equipment. but his good buddy celico bailed him out and painted it for free. so we think. I do not like Manfre and look forward to his defeat but this article is no place for these comments. I wish a speedy recovery to all those affected by this storm and may we all realize and appreciate that we were spared the agony some of these people are now going through. Watch out, the City of Palm Coast Code Enforcement Agents may ticket the damaged homes. Helpful city that they are. Must be joking!..Where are the 5.4m estimated damage according to the city? Shows you just how fast these tornadoes blow up. It also makes me wonder on what criteria the local EMS uses to call with the “a tornado is imminent” warning–and I’m not saying that to be critical, I am genuinely curious. I know they called us here in Matanzas Woods for the early-Sunday-morning warning (which expired without incident), but we got nothing for the Saturday night one that actually hit further south. I am curious because I can’t even imagine how anyone could have predicted this thing, with any great deal of lead time, as erratic as it appears to have been–and I wondered if calls go out only to certain neighborhoods, that the city or county can ”drill down” that efficiently, to send out calls by block or street or section of the city (L, B, F, etc.). Some folks got calls for the earlier storm, I just wondered who actually got them. Just saw that this had happened, no tv or radio for several days and it didn’t show up on news sites I see. I hope you and yours are ok, Pierre, and I’m assuming you are. My sister in KY has been thru 2 or 3 of these events in the past few years. No fun are they. Glad to hear there were no deaths. Good reporting, PT.